We’d love your help. Let us know what’s wrong with this preview of Ignition! by John Drury Clark. Ignition! is the story of the search for a rocket propellant which could be trusted to t Ignition! is the inside story of the Cold War era search for a rocket propellant that could be trusted to take man into space. A favorite of Tesla and SpaceX founder Elon Musk, listeners will want to tune into this "really good book on rocket[s]," available for the first time in audio. Ignition! is the story of the search for a rocket propellant which could be trusted to take man into space. This search was a hazardous enterprise carried out by rival labs who worked against the known laws of nature, with no guarantee of success or safety. To ask other readers questions about Ignition!, please sign up. Is there an e-book version that doesn't look like someone took a 10-times-Xeroxed copy to an OCR scanner that was someone's freshman computer science project? This book really had me giggling (descriptions of bizarre characters who were in rocketry, mentioning dioxygen diflouride in a mere aside) or gasping (ordering dimethyl mercury by the barrel). I also added a bit to my vocabulary (eutectic) and learned a heck of a lot about how difficult rocket science can be. Parts become a bit dry in the latter half, as the basic science converges more and more on a few optimal fuels. As implied by the title, you won't hear very much about solid fuels or hydroge This book really had me giggling (descriptions of bizarre characters who were in rocketry, mentioning dioxygen diflouride in a mere aside) or gasping (ordering dimethyl mercury by the barrel). I also added a bit to my vocabulary (eutectic) and learned a heck of a lot about how difficult rocket science can be. Parts become a bit dry in the latter half, as the basic science converges more and more on a few optimal fuels. As implied by the title, you won't hear very much about solid fuels or hydrogen-fueled rocketry here, alas. A ton of fun for anyone who really likes science and can read or at least look past a few reaction equations (maybe 25 in the whole book, not essential to understanding). I giggled so much reading this book that my coffee shop neighbor turned to me and demanded to know how a book clearly full of dry chemistry discussion could be so funny. The answer is easy to broadly furnish: when a motley gaggle of somewhat underfunded chemists are asked to find, somewhere on the frontiers of chemistry, substances that will, among other things, ignite upon contact and yet not be too explodey otherwise or burn through their containers, and a writer and chemist of the calibre of I giggled so much reading this book that my coffee shop neighbor turned to me and demanded to know how a book clearly full of dry chemistry discussion could be so funny. The answer is easy to broadly furnish: when a motley gaggle of somewhat underfunded chemists are asked to find, somewhere on the frontiers of chemistry, substances that will, among other things, ignite upon contact and yet not be too explodey otherwise or burn through their containers, and a writer and chemist of the calibre of John D Clark decides to personally document the early days of such a search, hilarity is bound to ensue. It is somewhat harder to explain how hordes of bats and the smell of skunks figure into the story, nor how the wholesale destruction of test equipment, limbs, and the occasional warehouse add humor. By the end of Ignition!, one should not be surprised to find a bundle of laughs even in a dry explanation of how yet another ill-advised exotic chemical freezes too soon to be useful. Because by the end of the book, even for someone such as myself whose memory of Chemistry 101 is about as fresh as a tank of sludgy RFNA, the reader will have acquired some kind of the knowledge and sense these applied science heroes learned the hard way about rocket propellants, and likely some of same looney mentality towards horrifyingly unstable sounding compounds: "tetranitromethane? That's a terrible idea. Let's burn it and see what happens!" For rocket history and chemistry enthusiasts, I have no reservations recommending this book. For everyone else, you may still find enjoyment out of it by skimming the drier sections on details like optimum exhaust products and looking for the parts that go bang. This is a curious book: one part memoir, one part scientific history, one part technical primer. The topic is the development of liquid rocket propellants (fuels, oxidizers, and monopropellants) roughly 1940 - 1970. This was a large intensive chemical-engineering effort. Rocket propellants have a remarkably wide range of design constraints, some of which I would never have thought of on my own. They have to be high-energy compounds that can be reliably lit, but that are safe to store (sometimes f This is a curious book: one part memoir, one part scientific history, one part technical primer. The topic is the development of liquid rocket propellants (fuels, oxidizers, and monopropellants) roughly 1940 - 1970. This was a large intensive chemical-engineering effort. Rocket propellants have a remarkably wide range of design constraints, some of which I would never have thought of on my own. They have to be high-energy compounds that can be reliably lit, but that are safe to store (sometimes for years.) They need low freezing points and high boiling points (depending on application.) They should be dense. They should burn to produce gasses, and not leave soot all over the engine. They should be relatively non-toxic and non-corrosive. Ideally, they should ignite on contact. These constraints often work against each other -- chemicals that react quickly often react badly with piping and human tissue. High-energy compounds often decompose on their own, when that isn't wanted. One of the major themes in the book is the development of hypergolic compounds -- those that ignite promptly on contact. This is harder than it sounds. "If your propellants flow into the chamber and ignite immediately, you're in business. But if they flow in, collect in a puddle, and then ignite, you have an explosion which generally demolishes the engine and its immediate surroundings. The accepted euphemism for this sequence of events is a "hard start." Thus a hypergolic combustion must be /very/ fast, or it is worse than useless. The author has a vivid engaging prose style -- at one point he wrote commercial science fiction. The preface is by his fellow chemistry PhD Isaac Asimov. However, it gets quite wonky in places and I occasionally felt like I needed considerably more organic chemistry knowledge to keep straight what was happening. There are no footnotes, references, or technical background sections. You're expected to just know what the various chemical terms are. You should know what a eutectic is and what connection it has to freezing points. For a prose sample: the specification for JP-3 jet fuel "...was remarkably liberal, with a wide cut (range of distillation temperatures) and with such permissive limits on olefins and aromatics that any refinery above the level of a Kentucky moonshiner's pot still could convert at least half of any crude to jet fuel." In addition to illuminating the technical challenges of propellant engineers, the book is also a fascinating view into the social dynamics of the rocket world. Most investigations ran on defense R+D contracts, managed with varying degrees of wisdom. Test hardware was often home-made from salvaged parts. (The author describes a test rig for shock sensitivity as being made out of an old destroyer turret with additional reinforcement -- "the plating on a destroyer is usually thick enough to keep out the water and the smaller fish.") The number of researchers was very small, and they all went to the same conferences every year. On the other hand, once you had a chemical you wanted, you could put it out for bid to the chemical industry quickly and easily. I was struck by the names of the chemical firms that the author tosses off -- most of which are gone, and some of which are gone and disgraced -- the Ethyl Corporation, W R Grace, Standard Oil of California, and more. On some level I liked this book.....but I'm not sure how this book got such a good rating. It's not a particularly good "story", it's monotonous and dry....but is weirdly "not awful". So if you can read the following random page from the book and then think...."I'll be happy to do that 200 times more"......then you're in for a treat....otherwise 3-stars. "Then as O2 is essentially insoluble in nitric acid, it bubbles out of it and the pressure builds up and your acid turns red from the NO2. What t On some level I liked this book.....but I'm not sure how this book got such a good rating. It's not a particularly good "story", it's monotonous and dry....but is weirdly "not awful". Here is the complete history of propulsion chemistry in one hilarious book. It is very well written. And it's breathless pace keeps the story going (even when the chemistry threatens to bog it down). At the dawn of the 20th Century humans around the globe -- in Russia, Germany, England, the United States and China -- dreamed of firing rockets into space. Initially unaware of each other, their efforts pursued similar paths. And by the middle of the century there was a consensus: a rocket engine fu Here is the complete history of propulsion chemistry in one hilarious book. It is very well written. And it's breathless pace keeps the story going (even when the chemistry threatens to bog it down). At the dawn of the 20th Century humans around the globe -- in Russia, Germany, England, the United States and China -- dreamed of firing rockets into space. Initially unaware of each other, their efforts pursued similar paths. And by the middle of the century there was a consensus: a rocket engine fueled by chemical reaction would propel humans into -- and through -- outer space. It was up to the propulsion chemists to discover and develop the ingredients -- the chemical fuels -- that could be used to produce the necessary thrust to propel rockets into space. it's like you read about the wild west of science; that's what uncharted territorry and defense money combust into. foreword by asimov if you weren't convinced. Highly amusing, serious and complete. Spontaneous Self Disassembly shall never be forgotten. When I heard that Rutgers was reprinting this book, I jumped at the chance to own it (I had previously had a photocopied version of the book due to its extreme rarity). It is astonishing that the book is as popular as it is considering how technical it is. I am not a chemist and a rather slow mathematician, so a lot of the book was inaccessible to me. However, why people read it is for the other part, the snarky, candid, and fascinating look into the Wild West days of rocket propellant developmen When I heard that Rutgers was reprinting this book, I jumped at the chance to own it (I had previously had a photocopied version of the book due to its extreme rarity). It is astonishing that the book is as popular as it is considering how technical it is. I am not a chemist and a rather slow mathematician, so a lot of the book was inaccessible to me. However, why people read it is for the other part, the snarky, candid, and fascinating look into the Wild West days of rocket propellant development from 1945 to around 1960. Although much of the book looks forbidding, and is, somehow it is very easy to navigate around it. Space historian Michael Neufeld has argued that people confuse "rocket science" with "rocket engineering" where the former is seen as the search for basic knowledge and the latter is seen as the practical application of scientific knowledge. As a sociologist of science and technology, however, I am aware that the distinction can get tendentious, although I do agree at a basic level that Neufeld is right. This book, however, shows how engineering and science can meet and in fact the book is a classic case of the melding of rocket science and engineering. Clark was the head of propellant research at the Naval Air Rocket Testing Station (NARTS) in the 1950s. As such, he was responsible for the development of liquid propellants under the aegis of military needs at a time when rocketry had shucked its association with mad science and had become legitimate. If I have any particular ding with the book, and it's really a minor one, I wish he had set the stage more with a discussion of the kinds of projects the US military was engaged with. For my own part, I am well versed in the history so it wasn't a problem. The irony of the book is that it has relatively little to say about those propellants that have come to dominate the human space program and commercial rocket launches because those same propellants were not militarily useful. Whereas NASA and commercial launches can use relatively commonplace propellants like liquid oxygen and RP-1 (refined kerosene) as well as liquid hydrogen, these are not "storable" propellants, i.e. liquids that do not need cryogenic cooling to liquify and use. So, what this book contains is perhaps the finest record we'll ever possess (as the participants are probably nearly all dead now) of the efforts made in using storable liquid propellants primarily for military use. In terms of general space science, perhaps the chapters with the most ongoing relevance are the ones on hypergolic fuels and oxidizers such as nitrogen tetroxide, hydrazine (in its many forms), as well as other nasties such as red fuming nitric acid and so on. These fuels are being phased out. The Russian Proton and the Chinese Long March, both powered by hypergolics, are both on the road to retirement. Hypergolics are fuel/oxidizer combinations which combust when mixed together. In general, they tend to be both hideously toxic and corrosive (the worst rocket accident ever, the Nedelin disaster on October 24, 1960 involved a hypergolic fueled ICBM). However, they were used extensively because unlike liquid oxygen and its various fuel combinations, hypergolics started easily and had good combustion characteristics. Of course, since 1960 the state of the art has moved on, there have been hundreds of thousands of rocket firings, and cryogenics have largely been tamed, and our current environmental consciousness is against hypergolics, and this is no bad thing. Much of the rest of Clark's book is taken up with other forms of storable propellant, including monopropellants (usually mixed oxidizer/fuel combinations) that are truly alarming. Indeed, Clark seems to have been lucky to have escaped unscathed from this research. The book also does not address solid fuels, which in the end replaced liquid propellants for all tactical military purposes as well as for the bulk of the nation's ICBM force. But Clark was not a part of that research, so he, rightfully, doesn't address it. It would be nice if someone could write the history of that program. As a science and technology scholar, there is plenty of grist for the mill for me. Clark extensively discusses many of the practices and the foibles of rocket propulsion chemistry in a constructive way. He reveals that science is not pure, but impressive nonetheless. He also has a lot of harsh words for the ways, even then, that computers could be used in a very sophomoric way for research. Not for the general public but more for chemists or engineers in the rocket business. Too many details on chemistry makes it hard to enjoy the witty parts. I should have tried the sample on Kindle before buying. To be honest its hard to keep up when there is too much Chemistry involved. And after some point in the book, all you hear is the names of elements, molecules etc. I am sure its a good book for someone who is really good at Chemistry or has a degree in the field but it was too much for me, hardly finished. One of the most hilarious and refreshing reads I had in a very long time. A true classic for space enthusiasts! Science drama at its best. Amazingly detailed and very well structured text on the development of liquid rocket propellants in US in 1940's-1960's . Author was one of the chemists active in the field at the time and draws on first-hand personal experiences as well as broader professional competence to give comprehensive and detailed annals of the craft. The text mentions main actors in the field at the time, as well as describes important milestones of the research. The text reads quite well for Science drama at its best. Amazingly detailed and very well structured text on the development of liquid rocket propellants in US in 1940's-1960's . Author was one of the chemists active in the field at the time and draws on first-hand personal experiences as well as broader professional competence to give comprehensive and detailed annals of the craft. The text mentions main actors in the field at the time, as well as describes important milestones of the research. The text reads quite well for a book that mentions more that one chemical compound on every single page. It is strurctured by the main type of propellant, each chapter describes the basic science involved so that a reader without specific background in chemistry can appreciate the details of the story. While Clark claims that you don't need a chemistry background to understand this book, it's definitely something I'd recommend. Nonetheless it is a great primer on early rocket work in this country (though because of when it was written, not such a good primer on work done behind the Iron Curtain). It's also a pretty funny read. Clark, John D. Ignition! An Informal History of Liquid Rocket Propellants. New Brunswick, N.J.: Rutgers University Press, 2017. With forward by Isaac Asimov. Original edition 1972. This is a snarky historical account of the development of rocket fuels, post-World War II, by one of the participants. On the way, the author explains how one evaluates a rocket and what makes a good rocket fuel. A fair bit of basic chemistry and physics is required to follow the book. The account is both funny and terrifying. A propellant’s basic job is to burn steadily and intensely. Propellants are two-part combinations: something to burn, called a fuel, and something to burn it, called an oxidizer. Good rocket fuels are one step away from explosives and good oxidizers eagerly burn things. Research in rocket science involves lots of explosions and lots of things burning up. Just igniting propellants can be difficult. If ignition is late, a pool of almost-ready to burn propellant accumulates in the rocket engine and explodes, destroying the engine. Propellant research often focused on “hypergolic” propellants, which do not need an igniter, instead starting to burn as soon as they are mixed. Again unsurprisingly, the fuel in a hypergolic propellant is likely to burn very quickly with things that aren’t its intended oxidizer like, say, air. The oxidizer can be equally terrifying: chlorine trifluoride (not widely used) strikes terror into anyone who understands the formula. One of the best liquid propellant combinations, used in the Saturn V boosters of the Apollo project, is liquid hydrogen and liquid oxygen, but it is not possible to keep a missile ready for a quick launch fueled with those, let alone the use them on a battlefield. So, missile designers turned to other propellants. This is an account of the development of terrifying chemicals: lots of nitrogen-nitrogen bonds, fuming nitric acids, highly reactive fluorine compounds, and so forth. It is also an account of the experiments and experimenters; a reference for anyone working in the field in the future. On the way, a basic discussion of how to evaluate a rocket fuel is given. And there are explosions, lots of explosions. The book is by turns scholarly, funny, and horrifying. The amount of energy and material spent on developing military rockets was huge, and the fuels used were explosive and highly toxic. Clark has a funny, sarcastic style that makes reading the book easy, but one is left wondering at the sheer amount of effort and material spent on delivering death and destruction. One is also left wondering at what path the civilian space program would have taken without the boost from military research. Perhaps near-earth space travel would have been more developed before the moon was reached. So, a fascinating book if one is interested in rocketry and has the education necessary to follow the technical discussions. Certainly one of the most quotable books I've encountered for a while. Each chapter presented several excerpts which it was impossible not to share with someone or other. Part of this is certainly Clarke's writing style, which exudes a sort of flippant humour even when he is detailing something as dry as the chemical structure of some complex hydrocarbon. But much of the book's appeals comes from how genuinely crazy and dangerous the history of rocket propellants was. In what other field could engineers claim to have corroded most of the expensive machinery in an engineering building, created both skunk-like and lemon-fresh odors, and created a constant flame as hot as the surface of the sun, all while routinely blowing up not only their complex test equipment, but also most of the surrounding area? Clarke is abundant with these sorts of anecdotes, punctuating each chapter with remarkable attempts and catastrophes. However, this is not merely a slapstick surface history -- Clarke genuinely does communicate the history of his field, detailing the many fuel and oxidiser combinations which have been attempted, their chemistry, the intuition for test systems and standards, and the hurdles and the many secondary issues which prevent fuels from taking off. It turns out that, burn properties notwithstanding, a fuel component which eats through its drum, is toxic on contact with the skin, and produces nigh-undetectable but lethal fumes, is not all that welcome in the services. The ones that will freeze on a cold day, or suddenly explode for no reason at all on a warm one are even less welcome. Ignition! first came to my attention, I believe, when it was mentioned in one of Derek Lowe's excellent "Things I won't work with" column at ScienceMag.org. After voraciously reading through Derek's back catalogue, I decided to hunt down a copy of Ignition! Luckily it just received a reprint through Rutger's University Press, so what an inexpensive pickup. Ignition! is a world apart from the type of nonfiction I usually read. Much of the nonfiction I consume could broadly be classified as pop-sci Ignition! first came to my attention, I believe, when it was mentioned in one of Derek Lowe's excellent "Things I won't work with" column at ScienceMag.org. After voraciously reading through Derek's back catalogue, I decided to hunt down a copy of Ignition! Luckily it just received a reprint through Rutger's University Press, so what an inexpensive pickup. He visited me some weeks later, and I asked him what Jefferson's substituted piperazines were used for. He answered, in a drawl as flat as Texas, "Well, they're a lot of farmers down our way, and they raise a lot of hawgs. And the hawgs get intestinal worms, and don't fatten up the way they should. So the farmer puts some of the piperazine in their feed, and the worm goes to sleep and forgets to hold on. And when he wakes up the hawg isn't there any more!" Even if you don't much like chemistry (and Lord knows I strategically wormed my way out of science classes in college), Clark sure as heck is an interesting guy to read! He's charming, smart, approachable, and ostensibly a sane man in an industry of absolute lunatics. As he repeatedly notes, the history of rocket fuels is a place for people with more courage than common sense and it's a miracle more of his stories don't end with well-intentioned chemists losing limbs (though plenty do!). And good golly is that surprisingly fun! It is, of course, extremely toxic, but that's the least of the problem. It is hypergolic with every known fuel, and so rapidly hypergolic that no ignition delay has ever been measured. It is also hypergolic with such things as cloth, wood, and test engineers, not to mention asbestos, sand, and water—with which it reacts explosively. It can be kept in some of the ordinary structural metals—steel, copper, aluminum, etc.—because of the formation of a thin film of insoluble metal fluoride which protects the bulk of the metal, just as the invisible coat of oxide on aluminum keeps it from burning up in the atmosphere. If, however, this coat is melted or scrubbed off, and has no chance to reform, the operator is confronted with the problem of coping with a metal-fluorine fire. For dealing with this situation, I have always recommended a good pair of running shoes. The text stretched my high school chemistry to its breaking point, and then broke it. 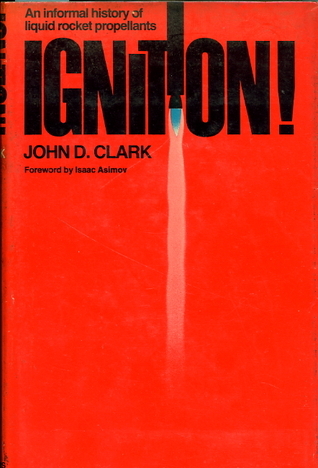 While I won't pretend to understand much of the actual science, I was drawn in by Dr. Clark's bone-dry prose and hilariously understated anecdotes, as well as his humourously cy Ignition was written by one of the scientists working on rocket propellants from the 1940s to the 1970s. Back when there was a Cold War on, meaning missiles of various varieties, and a Space Race on, meaning rockets of various varieties. The text stretched my high school chemistry to its breaking point, and then broke it. While I won't pretend to understand much of the actual science, I was drawn in by Dr. Clark's bone-dry prose and hilariously understated anecdotes, as well as his humourously cynical view of government research projects. When asked how to handle a certain unstable explosive compound, he writes "I recommend a good pair of running shoes". The period described was a golden age for propellant research, and government agencies were throwing around silly money to projects with little or no chance of success, in the hope that something would stick. In that way it is very much a sideline commentary on a time where mankind went from Earthbound to Spacebound; a time when science and technology were the answer. Just a bit more research and we can crack just about anything. What can I say. I am glad I had 2 semesters of chemistry before reading this book AND have a huge interest in astronomy. J.D.Clark is a wonderful storyteller while being a scientist. This book will flood you with knowledge of liquid propellants you never expected, BUT you will probably need wikipedia to get through it. It's a scientific read that is also entertaining. You can see through the eyes of a man who shaped a small part of our history. The struggles but also the amusement and fascinatio What can I say. I am glad I had 2 semesters of chemistry before reading this book AND have a huge interest in astronomy. J.D.Clark is a wonderful storyteller while being a scientist. This book will flood you with knowledge of liquid propellants you never expected, BUT you will probably need wikipedia to get through it. It's a scientific read that is also entertaining. You can see through the eyes of a man who shaped a small part of our history. The struggles but also the amusement and fascination with this subject. Probably my favourite parts are the stories of him and his collegues across the globe accidentally blowing things up and his delightful discriptions of different chemicals. Also by the end of this book you will probably watch SpaceX launches and historic footage of rocket launches through completely different eyes. I highly recommend this book if you're into rocket sciences and astronomy and have had some training in chemistry. hydrazine - apparently this and flouride where the gold starred fuels of the book. and hypergolic, meaning that when two propellants make contact they will immediately combust, eliminating the need for an igniter. Other interesting notes - calculating the results to what would be emitted out of the rocket nozzle was among the hardest things to do in the launch of Saturn 5, because of the lack of computing power available. - Propellant chemists had among the hardest jobs, as they often had to say to the engineers above them that the fuel compounds they were recommended would melt at a higher temp, is unstable, and would violate the laws of thermodynamics. Originally started reading the PDF version of this in April 2016, but since the PDF was suboptimal, I stopped reading it after a while. Then the new release came out, and I waited for three months (!) for my copy - yes, it was this popular. What can I say. It's a pretty great book. If you are at all interested in rocket fuels or chemistry, I highly recommend it. While I don't have the faintest clue about chemistry, the anecdotes alone are worth reading the book for, and I can only imagine that ch Originally started reading the PDF version of this in April 2016, but since the PDF was suboptimal, I stopped reading it after a while. Then the new release came out, and I waited for three months (!) for my copy - yes, it was this popular. Dr Clark lays out the history, timeline, challenges and foibles of a small group of smart people charged with finding the best rocket fuels for a variety of applications. Many promising things were tried, and many things turned out not to be a simple as they seemed on paper. Thanks to funding from various government sources, no stone was left unturned in conventional chemistry. The chemistry does get a little dense, but its a good read regardless.